Euthanasia is an undesirable but accepted reality for both the sea turtle rehabilitator and the field biologist who encounters a severely debilitated or terminally injured turtle. It raises practical and ethical issues which must be considered to prevent undue stress and suffering to the turtle and personnel involved. The term euthanasia derives from the Greek eu, meaning good, and thantos, meaning death. The American Veterinary Medical Association’s Panel on Euthanasia defines a good death as “one that occurs with minimal pain and distress”. The goal of euthanasia is to minimize the suffering of an animal whose condition is terminal. However, before this irrevocable decision is made, there are many factors to be considered. Firstly, the necessity for euthanasia must be determined. This should be established by professionals who are familiar with sea turtles, have assessed the extent of trauma and are knowledgeable about local resources available. Can the turtle survive its injuries? Can it in survive the wild in its current condition or does it need rehabilitation? Unless the situation is clearly grave (i.e., removal of 3 or 4 flippers, evisceration, or head trauma where the brain is visible), the decision to euthanize should only be made after consultation with a veterinarian that has considerable reptile (preferably sea turtle specific) experience. Caution is needed regarding euthanasia as what one may perceive as a terminal condition could be survived by one of these amazing creatures. 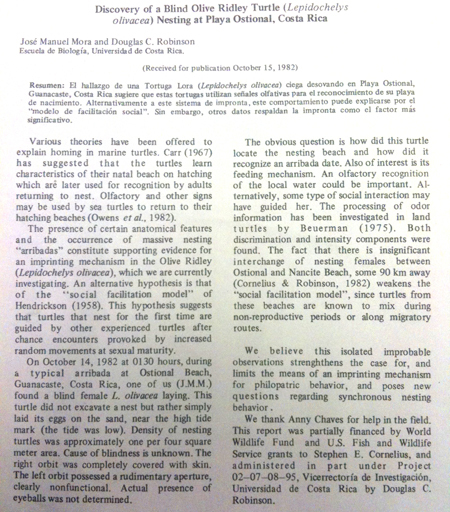 For example, there is a published and credible report of a congenitally blind female nesting on the beach. This report demonstrates that without vision this hatchling survived, thrived, mated and returned to lay eggs of her own. There are also reports of two-flippered turtles thriving in the wild and nesting. 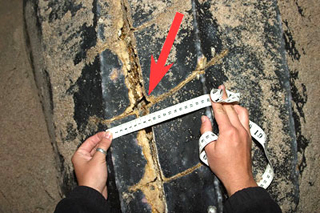 Full thickness carapace cuts from boat collisions may also seem like cause for euthanasia. 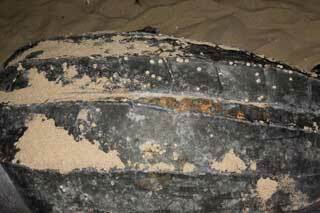 However, as noted on this leatherback, wounds of this type have healed over time. This nesting female was seen in both 2006 (left) and 2008 (right). Secondly, the method of euthanasia must be established. The goal of any euthanasia is to cause quick or instant loss of consciousness, followed by cardiac and/or respiratory arrest and loss of brain function, resulting in death. There are a variety of considerations that must be taken into account. Is there a skilled individual available that can carry out the procedure? What drugs or equipment are available? How will the remains be disposed? Will necropsy /tissue pathology to be performed? Administer an intravenous injection of euthanasia solution (a controlled, commercially prepared cocktail of pentobaritol and phenobarbital) at a dose of 0.5 ml/kg. This may be accomplished via the sub-carapacial sinus, parietal notch sinus, or any exposed vessel. If the IV route is unavailable, intracoelomic (ICo) may be used, however, the time interval between dosing and death is widely variable and dilution into equal parts buffered saline is recommended. More information on administration routes can be found in the Sample Collection section. Injection of other agents such as an over dosage of ketamine or telazol may also be used, but doages are unavailable. If potassium chloride or magnesium sulfate are used then the animal must first be anesthetized in order for the procedure to be humane. If neither IV or ICo is available for administration, then injection of the euthanasia solution into the foramen magnum or parietal eye may be used. However, this requires some skill and is difficult in larger patients. This method is only humane if the individual is completely anesthetized. Deep freezing by placement into liquid nitrogen is only appropriate for individuals less than 40 grams in weight. Future disposition of the carcass may affect the choice of euthanasia method. Commercial euthanasia solution contains barbiturates that may be ingested by scavengers resulting in toxicities in the scavengers. For this reason, if cremation is not an option then the use of controlled drugs is controversial. Inhalant agents (anesthetics, CO2/CO) are not appropriate as sea turtles can hold their breath for a very long time and survive prolonged periods of anoxia. Exsanguination is not deemed humane unless the animal is previously anesthetized. Freezing in a conventional freezer is very controversial as the formation of ice crystals in the blood vessels and skin may cause pain. The American Veterinary Medical Association panel on euthanasia does not consider this method humane. Cervical dislocation is not feasible due to the integrated articulation of the cervical vertebra. Decapitation does not destroy the brain which can continue to function even after prolonged periods of anoxia. Electrocution and drowning do not consistently result in a rapid, painless death. This chapter should be cited: Mettee, Nancy. 2014. Euthanasia. Marine Turtle Trauma Response Procedures: A Veterinary Guide. WIDECAST Technical Report No. 16. Accessed online [date].